Many want to believe that housing is staging a comeback. This is a logical wish since so much of our economy now relies on construction and related Suburban Experiment support endeavors. What we see today in the gyrations of the housing market feel more like the ebb of a losing battle than anything like a recovery. What our economy needs is real productive growth, not another bubble. We publish this blog generally three days a week (Monday, Wednesday and Friday) and weekly release a new podcast (Thursdays) and a new SID.tv video(Tuesdays). These efforts -- along with the expansion of the Strong Towns Network, our social space for people working to make their place a strong town -- are largely supported by your generosity. We are a 501(c)3 non-profit. If you are in a position to make a donation, we would greatly appreciate your support. The hard times have past. We've suffered through the worst. The light at the end of the tunnel is fast approaching. These are the platitudes we've been telling ourselves as 2012 came to an end and a new year began. Nowhere is optimism greater than in the real estate, construction and related industries. I have a fair amount of friends and casual acquaintances that are realtors. I may like and respect many of these people on an individual level, but it was a challenge to my Christian good will to continually be bombarded by them online with stories about the coming boom in housing. As a coping mechanism, I've saved some of these articles to share. U.S. home sales and prices are poised to rise in 2013, solidifying a recovery that began last year after a half-decade slump that was the deepest since the Great Depression, according to analysts and economists surveyed by Bloomberg. Record-low mortgage rates and attractive prices, supported by declining unemployment, are luring buyers as the inventory of distressed homes shrinks. Homebuilders are responding by adding supply, bolstering economic growth. After a 2012 marked by some hopeful signs of recovery in the Twin Cities commercial real estate markets, 2013 will likely hold more of the same -- provided the fiscal cliff negotiations in Washington are resolved quickly, a group of local experts says. “Construction has turned the corner and is coming back,” Chapman University economist Esmael Adibi told several hundred people attending the Building Industry Association of Southern California’s Riverside County chapter’s 21st annual Economic Forecast event in Riverside. With no major drags on the horizon at the local or national level, Adibi said he believes the Inland economy will add 25,000 jobs across all payroll sectors in 2013 — some 3,000 in construction — for a 2.2 percent gain over 2012, when 18,000 payroll jobs were added. The most recent report from the state Employment Development Department, for December, found year-over-year job growth of 1.1 percent. So let's take a look at housing. Economically speaking, in combination with finance, the construction industry is the primary manifestation of America's Suburban Experiment. Throughout human history, finance and construction (and government, for that matter) were trailing indicators of productivity; places that created a productive economy would then see demand for more construction and financial activities. In the six decades of America's Suburban Experiment, we wound up reversing that state of affairs. Now construction, along with finance, drives the economy. Increased demand for housing creates employment opportunities for construction workers as well as thousands of support industries, from manufacturers of porcelain toilets and HVAC systems to all the people selling furnishings at the Pottery Barn. Demand for housing also has the virtuous effect of raising home prices which, unlike any other thing we purchase, is considered good since it provides homeowners with additional wealth and purchasing power. This, in turn, fuels consumption and the virtuous, Keynesian cycle of demand-fueled growth churns on. As James Howard Kunstler is fond of saying, once you take all of the construction-related jobs out of the American economy, all you have left is brain surgeons and KFC workers. That is his satirical way of pointing out that our globalized economy is providing great opportunities for the very few that are well educated and well connected, but few opportunities (outside of construction) for anyone else. Take construction and the trickle down from it and the cupboard is pretty bare. Let's take a step back and look at the pre-Suburban Experiment and Suburban Experiment housing data as provided by Robert Shiller. It is important to note too that, while we certainly had suburbs and suburban development prior to 1945, America's Suburban Experiment is a combination of three paradigms, each untested, that we have uniquely combined in the post-World War II economy. An auto centric development pattern for urban, rural and suburban areas. A centralized approach to management of the economy, including growth and job creation. A fiat currency used as the world's reserve. I realize that many would put our one time oil endowment into that mix as well, but -- as unique and impactful as it was -- it was not a man made creation. In other words, we could have used the oil endowment without the other components of the Suburban Experiment as I have outlined them. I have no doubt that the converse of that statement is not true. Here's what volatility in the pre-Suburban Experiment housing market looked like. Note: there wasn't much. This is why it was so laughable to suggest that our housing price drop was even greater than in the Great Depression. In the 1930's, construction and housing were not the drivers of the economy. Prices went up and down, but nothing like the volatility of the Suburban Experiment. Data obtained from econ.yale.edu.Continuing this same line with the same set of base data, here is what the Suburban Experiment data looks like. Obviously, a lot more volatility. There are the three modest bubbles leading up to the huge bubble. You'll also note that, while we've dropped quite a bit from the high, housing remains about 23% higher than the historical averages would suggest. While I won't argue that housing values will fall a lot further (although the case for that ultimately happening is strong), it is hard to argue that housing is currently undervalued. The narrative being put forth today in the media by "experts" including those at the Federal Reserve is simple: We're in a cyclical recession (although technically out of recession, unemployment remains high) and, as soon as employment starts to creep up, the fundamentals of the economy are strong and we'll start to see a sustained, robust recovery. Time will heal these wounds. Let me give you a competing narrative. I've marked the four bubbles in that second graph. You'll note that they grow in size as time goes on. The first one is right in that spot I've identified as the end of the first life cycle of the Suburban Experiment. This was the time when the illusion of prosperity from the first generation of growth was starting to wane, when some of the bills were coming due and our economy was starting to stall. If our Suburban Experiment contained only the auto-centric development pattern, it would have died here, unable to be sustained financially. Unfortunately, a centralized approach to growth, development and job creation combined with the ability to create as much money as needed and have it be absorbed by the world to extend our great experiment. Like a pain killer for an ailing economy, we can see a little bit of rescue at (1), then when that little amount wouldn't do, a little bit more (2), then some more (3), then a whole lot more (4). We're now just heavily medicated full time, an economy as addict. The early fuel were things like the Interstate Highway Act, Fannie and Freddie, the FHA and other programs to expand home ownership and drive the Suburban Experiment. The late fuel -- the desperation phase -- involved financial fraud and the complete breakdown of the rule of law. If there is a fifth bubble -- and there very well could be -- it will undoubtedly involve all of the above, plus. Consider all of the things backstopping the fall of housing today. Continued historically low interest rates in defiance of market forces. Government guarantee of mortgages allowing waiver of minimum down payment and many ability-to-pay criteria. Government subsidies of mortgage interest. Massive Federal Reserve purchasing of securitized mortgages. The continued absence of the rule of law in financial markets. Enormous and ongoing bailouts of banks and insurance brokers. No major drags on the horizon? Consider just one of these factors: interest rates. My first mortgage back in 1996 was at something like 8%. We were told by family members that 8% was a fantastic rate -- almost a steal. Well, we just refinanced at 3%. If rates went back to where they were during Suburban Experiment bubble #3, then we're talking about cutting purchasing power in half. That's a lot of headwind if the economy ever does show signs of "recovering". From the website The Big Picture (click image for article). See the trouble here? If interest rates rise, which must happen in an improving economy, the only way to keep housing prices up is for wages to increase. Wages won't increase broadly until unemployment goes down. Unemployment, in the current economic belief paradigm, is solved by keeping interest rates low, stimulating construction and all the related industries. We actually have the negative feedback loop of the addict; we need the financial drug to keep going, but if we get going and the drugs are taken away, we're not fit enough to make it. To that point, let me throw one last graph at you, this one of unemployment. Image by the website ZeroHedge. Click on the image for the complete article.With an economy based primarily on propping up the housing market, we've become powerless to solve the underlying unemployment problem. The private sector can simply no longer borrow and build our way to anything that feels like prosperity, real or not. A fundamental shift needs to take place in how we generate wealth and prosperity, but we're stuck. We need housing to go up to solve the unemployment problem, but another housing bubble does not an economy make. This is going to be painful, but I don't see any way forward except for a local strategy of building strong towns. There was a lot of data and information I collected that didn't make it into this post. 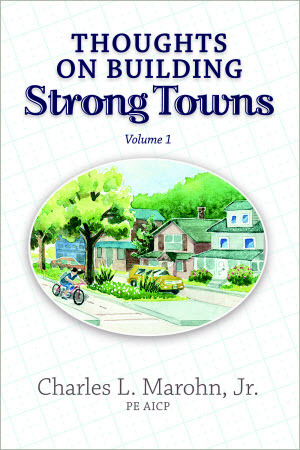 I'm going to be sharing that bonus material and some additional analysis over at the Strong Towns Network.